Most videos aren’t recorded in a single take, but rather are captured as multiple shortcuts that are eventually merged together. That is one of the main reasons why you should learn how to merge video clips together, as it will be integral when you wish to produce videos of any kind. As you can probably imagine, to merge videos requires a video editor – which is where Movavi Video Editor comes in. The reason why it is perfect to play the role of a video merger is due to its intuitive nature that will make merging video clips completely painless. Assuming you already have the video clips that you’d like to merge, just launch Movavi Video Editor and select the ‘Create project in full feature mode’ to open the editor. In the main window, you should then click ‘Add Media Files’ and select the two (or more) video files that you’d like to merge. When you’ve selected the video files, they’ll be added to the ‘Timeline’ area that occupies the lower part of Movavi Video Editor’s interface. If you want to change the order in which the video clips appear, you can click and drag them around in that area until you’re satisfied. Technically if you want you could save the video at this point by clicking on the ‘Export’ button in the lower-right corner and selecting a format. 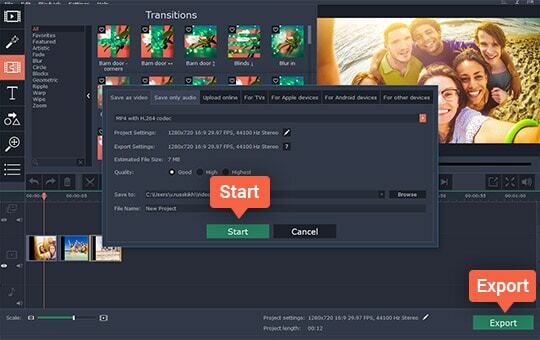 However, before you do that there are several other features in Movavi Video Editor that you may want to use. In most cases, you may have some excess or unnecessary video footage in one or more of the clips, in which case you could split the video and remove the parts that you don’t need. Additionally, you could choose to place one of the transitions in Movavi Video Editor between the clips that you’re merging so that they flow more seamlessly from one to the next. Make no mistake there are countless other features that may prove useful as well, and you should take the time to explore what Movavi Video Editor has to offer. More specifically you may want to use it to enhance the video quality, apply special effects or filters, add captions, insert audio tracks, adjust the audio levels, or transform the frame and orientation. All in all merging videos with Movavi Video Editor can be done quickly and without much hassle. The other features that it provides will let you edit the videos further, however, and give you the versatility that is required to truly produce excellent content. In short, it is the perfect way to quickly merge videos or join them as part of a more extensive project.